Beirut, Lebanon – Human Rights Watch will launch a billboard and online campaign on January 19, 2018, to end the waste management crisis in Lebanon, Human Rights Watch said today. 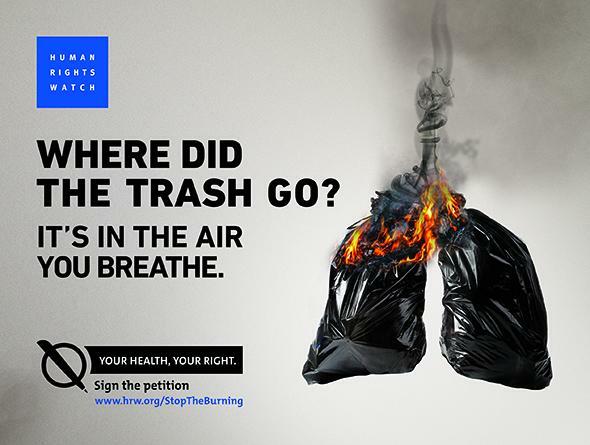 The campaign calls for an end to the dangerous practice of open burning of waste and for parliament and the cabinet to adopt a national waste management law and strategy that cover the entire country and comply with environmental and public health best practices and international law. In December 2017, Human Rights Watch issued a 67-page report, “‘As If You’re Inhaling Your Death’: The Health Risks of Burning Waste in Lebanon,” finding that authorities’ lack of action to end open burning of waste across Lebanon is posing serious health risks for nearby residents, violating their right to health under international law. Children and older people are at particular risk. Open burning of waste is a dangerous and avoidable consequence of the government’s decades-long failure to manage solid waste in a way that respects environmental and health laws designed to protect people. 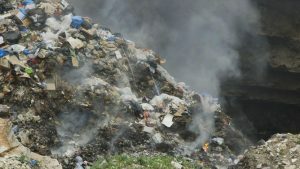 On January 9, the health minister ordered the inspection of open dumps across Lebanon for violations, stressing the prohibition on open burning. On January 11, the cabinet approved a waste management plan, presented by the Environment Ministry, that outlines a decentralized waste management system; stresses reduction, sorting, and recycling; and calls for gradually closing and rehabilitating open dumps. The Environment Ministry is developing a detailed national strategy on the basis of this plan. Lebanon does not have a solid waste management law or strategy for the entire country. In the 1990s, the central government arranged for waste collection and disposal in Beirut and Mount Lebanon but left other municipalities to fend for themselves without adequate oversight, financial support, or technical expertise. As a result, dumping flourished across the country, with open burning of waste taking place at 150 dumps every week according to the Environment Ministry. The open burning disproportionately takes place in lower income areas, Human Rights Watch found. Lebanon’s cabinet approved a draft law in 2012 that would create a single Solid Waste Management Board, headed by the Environment Ministry, responsible for national-level decision-making and waste treatment, while leaving waste collection to local authorities. However, parliament has not passed the bill. The joint committees of parliament considered an amended draft of that law on January 9, and returned it to the environment committee for further amendments. The Environment Ministry says that open burning violates Lebanon’s own environmental protection laws. The government’s lack of effective action to address the issue also violates Lebanon’s obligations under international law, including the government’s duties to respect, protect, and fulfill the right to health. Human Rights Watch found that the Environment Ministry lacks the necessary personnel and financial resources for effective environmental monitoring. According to researchers at the American University of Beirut, 77 percent of Lebanon’s waste is either openly dumped or sent to landfills even though they estimate that more than 80 percent could be composted or recycled. Recent discussions around a long-term plan for waste management in Lebanon have focused on the use of incineration plants. Human Rights Watch does not take a position on the particular waste management approach that Lebanon should pursue so long as it complies with environmental and public health best practices and international law. But some public health experts and activists in Lebanon have opposed the use of incineration, citing concerns about independent monitoring, potential emissions, and high costs. The public campaign launched today was made possible by generous support from Pikasso. This is exactly what happens when you have crooks running a country . These crooks don’t give a damn about the people , They don’t have to suffer like the rest of the Lebanese because their houses and cars are equipped with the most up-to-date AC systems . Today’s garbage contains paper, plastics, and other types of packaging waste that release a hazardous mixture of carcinogens and other toxics (such as lead, mercury, and arsenic) when burned. Even seemingly harmless items, like paper, mail, packaging, and cardboard boxes used for frozen foods, can give off toxic emissions. Among the health risks posed by garbage burning , dioxin—a known, potent human carcinogen and endocrine disrupter—is the main concern. Dioxin can have significant impacts on human immune, developmental, and reproductive systems. Dioxin exposure is especially harmful for children, pregnant women, and the elderly. Well, banning Spielberg’s movies (then reversing the ban in order not to look completely stupid) is much more rewarding than dealing with smelly garbage.